Around this time of year I feel like there are two camps of people, the camp that wants endless summer so they can live in their cutoffs and flip flops by the pool and the camp that cannot wait for the impending, delicious, wonderful, perfect weather, best food, cutest clothes season that is fall. Which camp do you think I fall under? I spyed this cozy study and couldn't help myself. 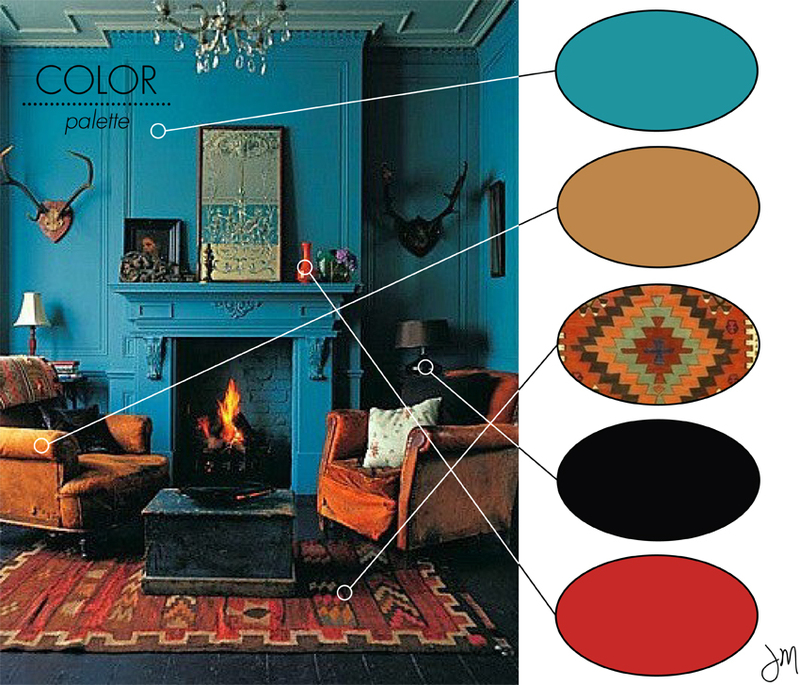 The combo of deep teal, warm caramel and red, and rich textures from the kilim has me wishing I could curl up with the Boy and a glass of Cab by the fire. See how to translate this look to your wardrobe below. What camp are you in? Would you prefer summer last until holiday season or are you twitching to pull out your boots and sweaters and watch some football? I am definitely in the "I can't wait for fall" camp! I'm counting down the days, and this photo isn't helping much...I just want to wear my boots and sweaters!